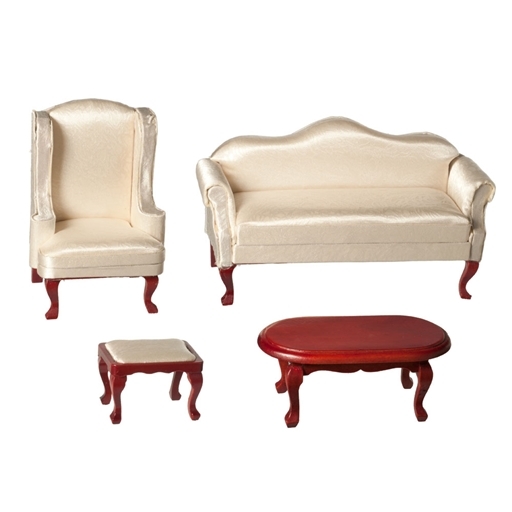 Perfect for a parlor or sitting room. 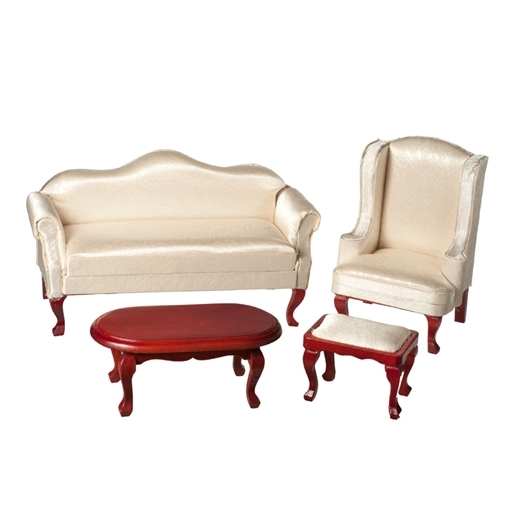 This set features a camel-back wing chair, ottoman, love seat and wooden coffee table with brocade-look off-white upholstery and mahogany finished wooden frames. Upholstery may vary slightly. 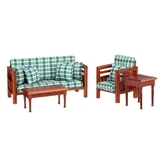 This set is a great value and nice quality. 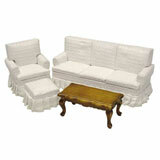 I have split up the set and will be using all three upholstered pieces in different rooms. The coffee table will be used in a different project. The ottoman was easy to paint with craft paints and then varnished and will be used in the walk in closet. on 11/18/2014 Don't buy this! I read the 2 reviews and bought it anyway. Mine has glue globs that look dirty on the light fabric. Also frayed on both front legs, loose threads and a big gap on the back of the sofa where the material isn't stretched and glued. Terrible quality. Does no one look at these before they are mailed? I am usually very pleased with products that I get from miniatures.com. I received this set and was unfortunately disappointed. The sofa frame was crooked, the material was frayed and the seems clearly visible. I guess you get what you pay for. I will however, continue to do business with miniatures .com because most of their products are of an excellent quality. 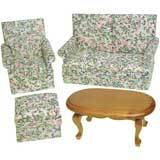 This set looks great in my parlor. I love the quality! This is perfect if you don't have a lot of space to work with. Very pleased!